Your guide to what’s on in Italy this winter, from art shows and sports events, to festivals and concerts. 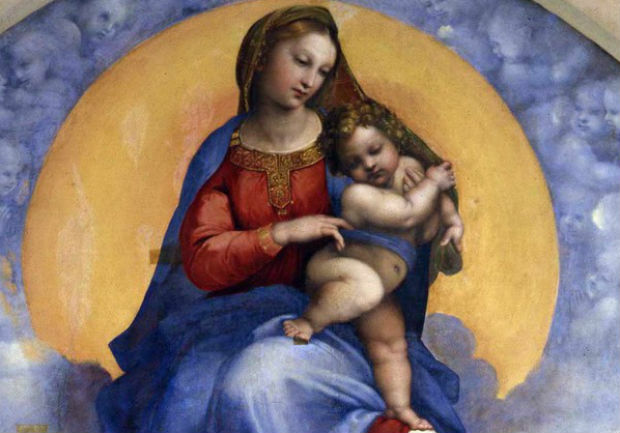 Raphael masterpiece, La Madonna di Foligno, which is part of the Vatican Museums vast collection, will be shown completely free of charge in the Sala Alessi of Palazzo Marino, in Milan during the holiday season. The exhibition is sponsored by ENI and follows the extraordinary exhibition of Caravaggio's The Conversion of Saul and four years of intense collaboration with the Louvre in Paris that made it possible to bring to Milan works by Leonardo da Vinci, Titian, Georges de La Tour, Canova and Gérard. This year exhibition inaugurates a partnership agreement with the Vatican Museums, one of the world's most prestigious cultural institutions. The show features work by some 80 Italian and international artists to celebrate a the 1970s and Rome. Photography plays a major role in the exhibition, with work by Ugo Mulas, Claudio Abate, Mario Cresci, Elisabetta Catalano, Tano D’Amico, Duane Michals. New artistic idioms such as video art will also be showcased through the work of a number of artists, including Italian videomaker Luciano Giaccari. An exhibition dedicated to 15th-century Sicilian painter Antonello da Messina. On show will be some works not present in the recent retrospectives dedicated to the artist, including his ‘Portrait Of A Man’ from the Philadelphia Museum of Art, ‘Salvator Mundi’ from London’s National Gallery and the ‘Madonna Benson’ from the National Gallery in Washington D.C.
Organised to mark the 2000th anniversary his death on 19 August 14 AD, the exhibition presents the stages in the dazzling personal story of Augustus in parallel with the birth of a new historical era. The adopted son and great-nephew of Julius Caesar, Augustus was a man endowed with exceptional charisma and political acumen. He succeeded, where even Caesar had failed, in putting an end to decades of bloody internecine strife that had worn the Roman Republic down to the bone, and in inaugurating a new political season: the Empire. The exhibition in the Scuderie del Quirinale, with a selection of approximately 200 exhibits of the highest artistic quality, offers visitors the opportunity to track the life and career of the princeps in parallel with the development of a new artistic culture and vocabulary that is still today the very foundation stone of Western civilisation. The visual pivot of the exhibition are the celebrated statues of Augustus, brought together here for the very first time: Augustus as Pontifex Maximus from Via Labicana, now in the Museo Nazionale Romano, and the Augustus of Prima Porta from the Vatican Museums. On the 150th anniversary of his birth, Genoa pays homage to Norwegian artist Edvard Munch with a golden retrospective at the city’s Ducal Palace. The famous painting ‘The Scream’ is one of the 150 works on show by the artist. The exhibition aims to illustrate his versatility, through canvases and other creations produced between 1880 and 1944, from oils and temperas to lithographs and woodcuts. ‘National Geographic’ magazine celebrates its 125th year with the photographic exhibition ‘La Grande Avventura’. At the same time, the magazine celebrates 15 years in Italy, making its inauguration at Rome’s Palazzo delle Esposizioni that much more special. The show includes images from the Society’s most renowned photographers, and includes photographs of the underwater explorations of Jacques Cousteau and James Cameron. Emphasising the key role that radical Russian artists played in the development of Modern art more than a century ago, this exhibition underlines their complex relationship with the Orient (both the Russian East and the Far East). Featured artists include Léon Bakst, Alexandre Benois, Pavel Filonov, Natalia Goncharova, Wassily Kandinsky, Mikhail Larionov and Kazimir Malevich. The biggest Christmas tree in the world will be lit at 6pm on 7 December 2013 at Gubbio in Umbria. Gubbio is a small medieval town at the base of the 2,950-foot-high Mount Ingino. 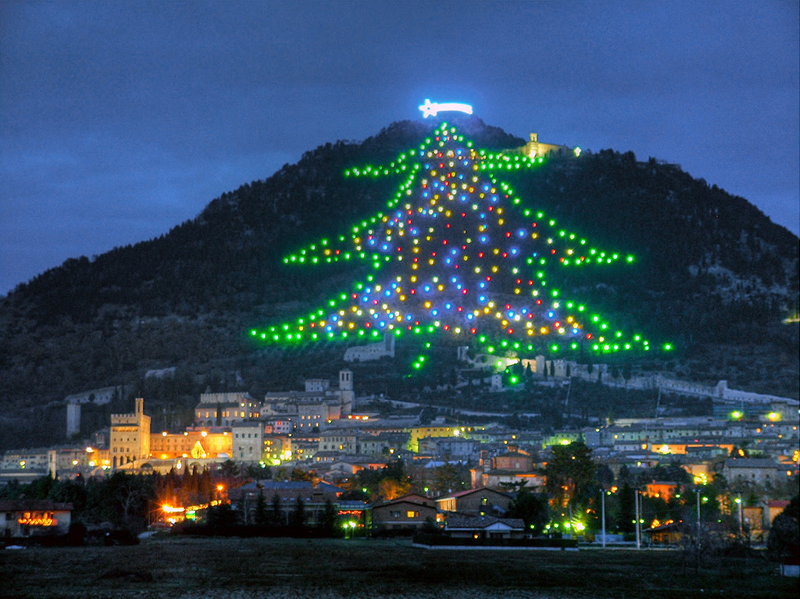 The tree is made of coloured lights and covers the slopes of Mount Ingino. More than 250 bright-green lights form the silhouette of a fir tree on the mountain ridge overlooking Gubbio. A group of local volunteers has been creating the illuminated tree since 1981. It entered ‘The Guinness Book of Records’ in 1991 as ‘The World’s Largest Christmas Tree’. Some 200 lights form a star shape at the top of the tree, which covers 10,764 square feet. The tree is 2,133 feet tall and 1,148 feet wide at the base. The interior of the tree is littered with more than 300 multi-coloured lights to look like decorative baubles. Some 27,887 feet of electric cable is used for the wiring, and 1,350 plug sockets are used to connect the cable and lights. It takes 35 kilowatts of electric power to illuminate the tree via a photovoltaic system. Volunteers take 1,900 hours to assemble the tree on scaffolding. The Christmas tree remains alight until 10 January 2014. Concerts and exhibitions will held in Gubbio at the base of the tree throughout the holiday period. The Cap d’Any a l’Alguer New Year celebration in Alghero, Sardinia is one of the most anticipated events on the island’s calendar. Celebrations take place throughout the squares and streets of the seaside town of Alghero. An annual event, the Cap d’Any a l’Alguer is in its 17th year. It forms part of a festival that starts on 8 December 3013 and runs to Epiphany on 6 January 2014, featuring tastings of wine and traditional Sardinian food, street artists, theatre, dance, exhibitions, children’s entertainment, street markets and art installations. Local bars and restaurants put on music events featuring folk singers, jazz musicians, rock bands and DJs. New Year’s Eve festivities start at the port and along the Lungomare Barcellona late in the evening, beginning with a cabaret and culminating with a firework display to music at midnight, followed by a concert that continues into the early hours of the morning. Brescia celebrates its patron saints, Faustino and Giovita, in February, when the city hosts as many as 250,000 visitors keen to enjoy the atmosphere. The festival includes art exhibits and cultural events, and a street market of local foods, wines, clothing and crafts takes over the city centre. Camogli in Liguria has an annual Valentine’s celebration called ‘Innamorati a Camogli’, during which the town is dedicated to lovers. Hearts are strung up everywhere, even on fishing nets, words of love are posted on banners, restaurants put on special menus and the weekly Wednesday market has a love theme. Commemorative Valentine’s plates, designed each year by local artists, are given to couples eating at certain restaurants. The Vatican Christmas Tree will be erected in St Peter’s Square in front of St Peter’s Basilica early December and then lit a week before Christmas to celebrate the holiday season. Mistletoe was an important element in the Celtic tradition and to celebrate its harvest, the Mistletoe Festival takes place in the Alps in early December. It is centred on a mistletoe street market with traditional foods, music and dancing. Prizes are awarded for the finest mistletoe, and the daylong event ends with a torchlight parade and the lighting of a druid fire, followed by a Celtic banquet with music and dance. A life-size nativity scene will be will be erected in St Peter’s Square in front of St Peter’s Basilica on Christmas Eve 2013. Verona is the town where the story of Romeo and Juliet is set. ‘Verona in Love’ honours romance during the week of St Valentine’s Day, when heart-shaped red lanterns illuminate the streets. Free concerts with a romantic theme take place at Piazza dei Signori, the Torre dei Lamberti is lit red, shops are decked out to reflect the love theme, restaurants offer romantic dinners, and entrance fees to local attractions are reduced. 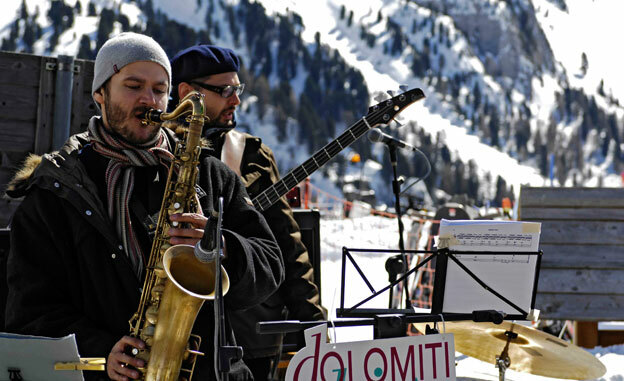 The Val di Fiemme is the setting of one of the Alps most important music festivals, the Dolomiti Ski Jazz. The event combines music and skiing. European and American jazz musicians descend on Val di Fiemme to participate in concerts and jam sessions performed on the ski slopes by day and in the pubs, theatres and nightclubs of the valley’s main towns by night. The La Scala opera season 2013 to 2014 opens on 7 December 2013, which is the feast day of St Ambrose, the patron saint of Milan and the city where the world-famous opera house is located. The season comprises 16 productions – 10 operas and six ballets – eight of which are new productions and two are new productions for La Scala. Seven opera titles are by the Italian composers Giuseppe Verdi, Gioachino Rossini, Gaetano Donizetti and Pietro Mascagni. Verdi retains the dominant position with three titles: ‘La traviata’, ‘Il trovatore’ (The Troubadour) and ‘Simon Boccanegra’. Musical director Daniel Barenboim will conduct three operas: ‘The Tsar’s Bride’ by Nikolai Rimsky-Korsakov, in a new production by director Dmitri Tcherniakov; ‘Simon Boccanegra’ by Verdi, in the 2010 production; and Wolfgang Amadeus Mozart’s ‘Così fan tutte’, a new production directed by Claus Guth. Barenboim will also be involved in the theatre’s symphonic season in March, the Philharmonic Season in February and in a special concert in June. ’La traviata’ will close 2013’s celebrations, as the eighth Verdi title, and will open the new season, with the return of Daniele Gatti on the opera podium. The ballet season begins on 17 December. The 12th season of Matera in Musica, the city’s official concert season, organised by Festival Duni and the Ico della Magna Grecia Orchestra, starts late November. The event includes 11 concerts between the end of November 2013 and May, 2014, and is part of the programme for the city’s candidacy for the European Capital of Culture 2019. Various performances are set to take place, including ‘Chiedo Scusa al Signor Gaber’, starring Enzo Iacchetti in a new symphonic version; and a musical review and comedy show by Lillo and Greg, in which the two revisit famous jazz numbers.